Με μεγάλη χαρά θα υποδεχόμαστε ξανά τον αγαπημένο μας και χαρισματικό νεαρό Δάσκαλο ΝΤΟ ΤΟΥΛΚΟΥ στη Θεσσαλονίκη! For a spiritual warior battling with this neverending stream of Samsara, Vajrayana is the strongest weapon to hold. It is a wonderful path full of wisdom, compassion and perfect action. Swift to enlightenment like nothing else, it really is the supreme alchemy that enlightens our ordinary mind.But, it has its own set of rules and path that may not be ideal for everyone. Many enter Vajrayana without having much information about it and this may lead to many misunderstandings and sufferrings. This time, we will attempt to discuss these issues. What is Vajrayana? How is it a superior path? 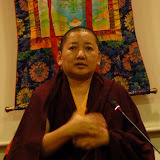 What are the downfalls when Vajrayana is practiced mistakenly? And, is it for everyone? 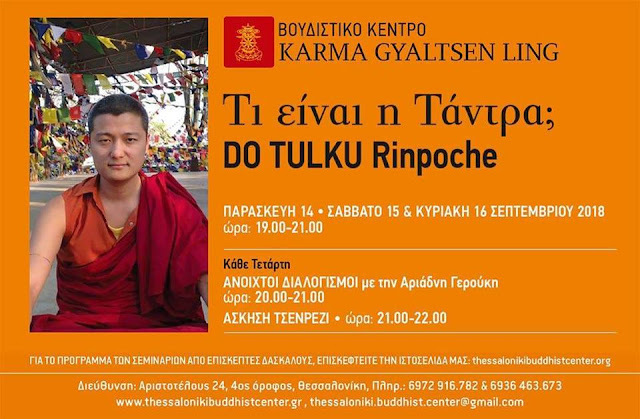 Αναρτήθηκε από Thessaloniki Buddhist Center στις 1:36 μ.μ. Address: 24, Aristotelous Street, 4th floor, 54623 Thessaloniki, Greece. * The Buddhist Centre is an institution that is financially independent of any individual, and any other public or private institution, and its maintenance is solely based on donations by friends of the Center.